WASHINGTON, D.C.—Trout Unlimited today praised a report released by the National Wildlife Federation that details the most current information available regarding the climate change impacts on, and threats to, America’s valuable fisheries resources, and the potential impact to fishing. TU’s science team contributed to Swimming Upstream: Freshwater Fish in a Warming World. The report, which builds on past reports by TU and a coalition of fish and wildlife conservation groups, is a strong science-based call to arms to address harmful and nationwide threats to trout and salmon resources, and angling opportunity all across America. Trout and salmon are on the front lines of the climate change battle. Trout and salmon depend on cold, clean, plentiful water to survive, all of which are threatened by predicted changes in air temperature and precipitation. Increased wildfire risk, decreased snowpack, droughts in some places, and intense floods in others, will radically impact trout and salmon habitat in the years to come. 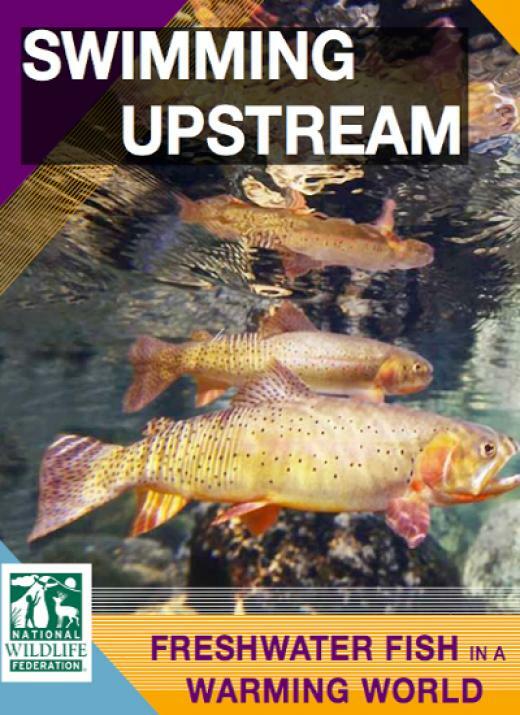 As the nation’s premier organization for protecting, reconnecting and restoring coldwater fisheries, better understanding these changes directly impacts Trout Unlimited’s core mission. Today’s report confirms that by mid-century, the future for trout could be bleak—as much as 50 percent of suitable habitat for trout in the West could be lost, and a dramatic reduction of brook trout habitat in the East, including complete elimination from iconic watersheds such as Shenandoah National Park, could take place. Using tools like the Conservation Success Index, TU’s scientists are working to integrate predicted changes in the climate with current threats to trout and salmon habitat. TU projects that range from very large—opening a 1,000 miles of habitat on the Penobscot River with our coalition partners in Maine, to the very small—fixing culverts and removing small dams in Virginia—help to build resilience to climate change in fish populations. Working with landowners, farmers, ranchers, industry and government agencies of all shapes and sizes, TU specializes in these types of projects. However, the report also correctly calls for tackling the root of the climate change problem, greenhouse gas emissions—without meaningful reductions in emissions, much of TU’s work could be outpaced by warming trends.